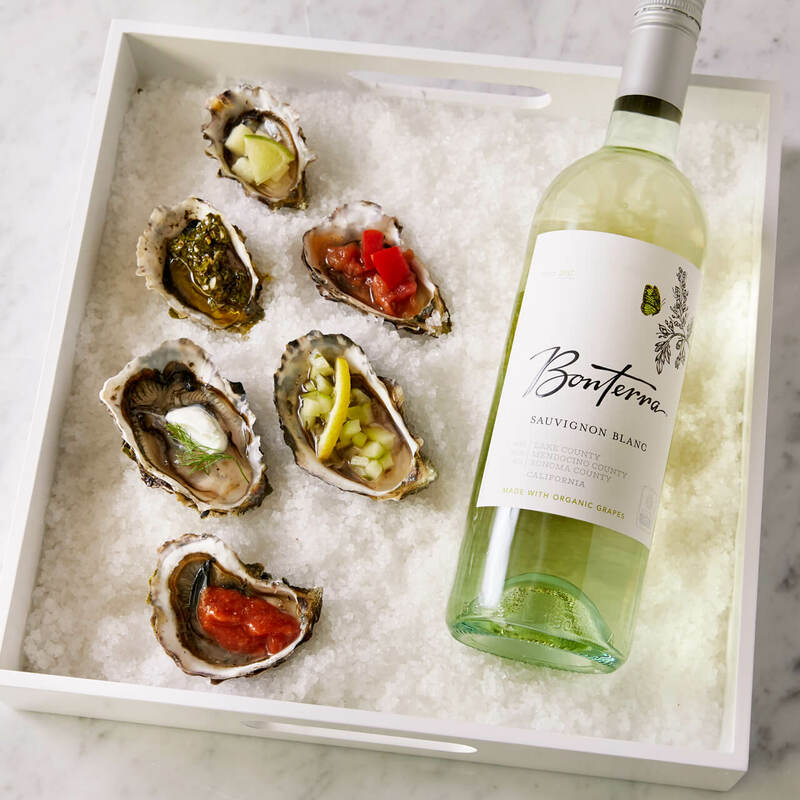 Not many things pair better with a plate of raw oysters than our beautifully crisp Sauvignon Blanc. Bring out the superb brightness of ripe citrus peel and mineral notes with our 6 recipes for dressing your favorite seafood, using fresh, organic ingredients. All recipes below to be served with raw oysters. Additional ingredients are listed with their corresponding recipe. Instructions: To clean, rinse oysters under cold running water. Cover them with crushed ice while shaking them to keep cool and clean away any dirt. To shuck them, wrap a small kitchen towel over one hand and hold the oyster firmly. Using an oyster shucking knife in the other hand, place the tip at the base of the hinge, twist the knife using pressure, then lever the knife upwards or twist to prise open. Instructions: Combine all ingredients, salt to taste, and blend. Instructions: Grate tomato over a bowl, discard skin. Add remaining ingredients to tomato pulp, salt and pepper to taste, and chill. Instructions: Peel and deseed the cucumber, cut flesh into small dice. Mix with remaining ingredients, salt and pepper to taste, and chill for 1 hour to marinate the cucumber. Instructions: Blend all ingredients together. Instructions: Blend all ingredients together and salt to taste. Instructions: Finely mince garlic clove. Chop parsley and oregano together with garlic to form a rough paste. Scrape into bowl and add olive oil, vinegar, and season with salt and pepper to taste. Place oysters on a serving plate, dress with desired toppings, and serve.